The culmination of 25 years of motocross goggle technology, Oakley's Crowbar MX Goggle offers the protection and performance demanded by the world's top MX riders. The Oakley Crowbar Motocross Goggle features a lightweight and flexible O Matter frame that is combined with optically pure Lexan to maintain impact protection that meets all ANSI Z87.1 and EN 1938 standards. Clear lenses are enhanced with F3 anti-fog treatment, the optics maximize your range of peripheral and downward view. You can't stay focused without comfort, so they engineered triple –layer face foam to wick away sweat, and strap outriggers for balanced pressure distribution. And to keep the strap from sliding, Oakley treated it with silicone. The Oakley Crowbar Motocross Goggle also comes with a removable nose guard and the Oakley 7-pack laminated tearoff system, the most advanced tearoff system on the planet. Re-designed and improved facial fit contour. Triple fleece face foam for maximum moisture wicking and comfort. Rigid O-Matter strap outriggers provide even distribution of goggle pressure. Quick release interchangeable strap attachments. Improved 3-pin attachment system for tear-offs. Increased lens sizing for greater visual range. Includes scratch-resistant and impact-resistant lens with anti-fog treatment, removable noseguard and laminated tear-offs. Wife likes them, says they’re comfortable and fit well with the new helmet. I've always worn Dragon MDX goggles and have liked them but decided to give Oakley a try. Wow. I wish I would have sooner. They fit great and really offer a great view. I was amazed at the lens clarity and how well I could see out of my peripheral view. Also, as an added bonus Oakley also included some tear off lenses in the box. That's the first time I've ever had that happen for me. The nose clip is able to be removed which I did for looks and added comfort. I'll be buying Oakley goggles from now on. Luckily I break stuff on the reg so if these last more than year I'll be very surprised. Great price if you can find it on clearance. Bought these to replace Spy Targa goggles that got damaged. Im an Oakley Fan boy so thought id give it a shot especially since these were on Clearance for $30 some dollars. They are PRETTY LARGE! Dont fit my face really well. But the venting and padding is great. Wish they were a bit smaller. 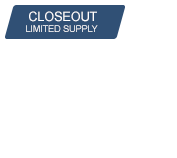 great goggles and always find a closeout. My go to for cheap and effective goggles. Love the nose guard! Have always had a good experience with Oakley goggles. These goggles are no different. Comfortable fit and very durable. Have held up well over time with no issues. It's a little over priced so I go with the sale colors. It's fits my prescription inserts and the foam lasts a long time. The tear off's are a little over priced but I have 3 pairs. The only real negative is that the "new" design makes using goggle quick straps almost impossible to install. No idea why they change it. Also swapping lenses is a little bit of a challenge so I have a clear one I leave in and a tinted one I leave it so it requires 2 pairs. Love the way these goggles look and feel. I've been running Oakley goggles for 10 years and don't plan on changing any time soon ! Got a pair of these on closeout, awesome! only complaint is in certain lighting I can see the goggle designs reflecting in the lens. These are very comfortable and block the sun pretty well. Used these for the entire WEXCR series last year and they held up well. Tear offs worked well. Absolutely love them! Going to buy another color too! Extremely comfortable, excellent field of vision, great lenses and cool styling. 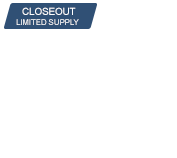 Excellent value especially a closeout prices, I may order another pair. The only minor drawback is that sometimes I notice the reflection of the graphics that are on the inside of the lens, it would be better if that surface was painted black so as not to reflect any light onto the inside of the lens. Comes with clear option, but the tint is perfect. Great on bright or overcast days, really comfortable fit, and the nose guard piece doesn't interfere with the fit over the helmet. No fogging and good ventilation. I really like they way these goggles feel on my face, and they don't seem to impact my field of vision at all. I also really like the subtle tint of the lenses, keeps the sun out but also increases contrast. I did have to remove the nose guard from my Scorpion helmet because it was interfering with the nose guard on the goggles, but now they work together fine. I wear a XXL helmet and the nose piece felt like it was constantly pushing down to the point it would reduce how much air you could get through your nose. Feels great with a wide view. Super comfy! I loved these goggles before I lent them to my brother and now he refuses to give them back. Will be ordering another pair soon! Fits perfect around helmet and doesn't fog up! Great Value and they work. I have standardized on these goggles for our race team due to functionality, value and wide selection of replacement lenses to meet the riding conditions. The crowbars are a perfect fit, I have a medium head size and regular face. Sweat absorbtion is good and the nose piece is super helpful for keeping out branches when riding woods. Comfortable and actually has cover to your nose to protect from roost. I have used these goggles a few times and never had a problem with them. The only flaw the them is its a challenge to change the lenses. <br>I bought the Ryan Villopoto signature goggles I have used these goggles a few times and never had a problem with them. The only flaw the them is its a challenge to change the lenses. Great goggles! 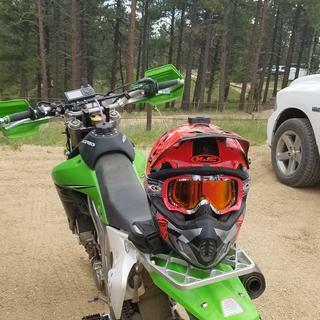 My guy had a helmet with a pull-down visor, but I decided to buy him a new fox helmet and chose these goggles to go with it. It's an awesome combination, looks great, very protective & comfortable! These were too small for me and the nose guard rubs on helmet. Nice goggles otherwise. 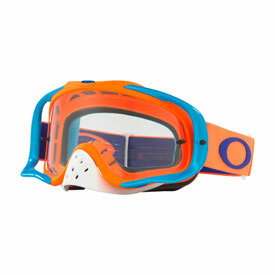 Best looking goggles I have ever seen. I love these and will refuse to ever buy another pair until I have to. Everyone asks where I got them. They also fit my XL Fox helmet perfect. Broke during a normal ride...no crash or debris hitting me...obviously a faulty piece of plastic, but Oakley refused to honor warranty. Oakley makes a great product but their goggles have nearly double in price over the last few years and they have not been changed in any way. Very disappointed with the price. i normally use Dragons, somehow everytime i use the oakleys i get dirt in them. Other than that they are nice looking. These Oakley Crowbar Goggles are incredible. The way the strap attaches it takes almost all the direct pressure off of your face. As with all Oakley products fit and finish was awesome, the goggles even have a three row rubber strip to hold them to your helmet, comes with five tear offs. I ordered extra lenses and the lens fits very snug even after repeated lens changes. I love these googles the fit my face very well and I have never had a lense crack. The nose gaurd helps also. great product... I will never get anything but Oakleys again! Been using the Crowbar's for 3 year's now and just love em! !They fit my face perfect and never fog up! !They are Very well made and tough also! !They come with a 7 stack of thier best tear-off's also! !Love the nose protection! !Great set of goggle's here!!! I have about 5 pairs of goggles and i always seem to go for these. They fit snug on your face and never fog up. I will order another pair when these wear out. Bought these to replace a pair of in-expensive Over the Glasses "OTG" goggles that kept fogging up. Wearing glasses stinks when riding in the hot Georgia weather and contacts do not work that great for me. These goggles have enough room for me to wear glasses and stay more comfortable than I was with my other pair. I like the tear-offs that came with them more than the other brand as well(that did not include them). Don't need to add them one at a time. The thinner tear-offs that are together at one end seem to be easier to maintain. Well done Oakley. Great fitting goggle and I like the coverage that the nose guard provides. Can't say enough about these goggles. They fit well, did not fog up, and had a nice tear off system to protect the lens. I did have to remove the nose-piece in order for them to fit my shoei helmet. I really like the goggles and think are they are good quality. The tear offs are a good idea and the reason I bought this particular pair. 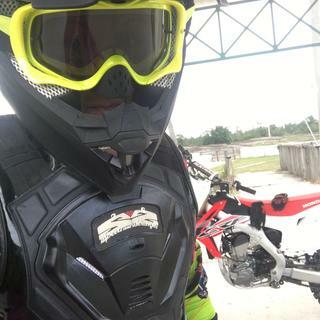 The only problem I have found is the heavy dust I ride in has gotten between layers on the tear offs defeating their main purpose.The goggles do have a nice clear lens and until the dust got in,the tear offs were awesome. whats the correct tear off setup with secondary pin? There's instructions on the box on how to set it up, having the flaps on the outrigger keeps them out of your field of vision unlike something like an o frame where they're always in your face.